In our public schools today students are being taught revisionist history, meaning they’re not being taught the truth about history. Rather, if history is taught at all, it’s a revised history meant to fit a liberal political narrative. And those revisions do not correctly portray our country’s founding fathers’ beliefs, why they founded the United States, etc. Ask a public high school student today to tell you about the people and events surrounding our Declaration of Independence. If you get more than a blank stare (they don’t teach a lot of history in school today), students will most likely tell you that rich capitalistic white people stole the land from the Indians. But fortunately the truth is easy to find. In 1492 Christopher Columbus bravely crossed the unknown Atlantic Ocean for the express purpose to bring the gospel to the unreached(1). In 1620, those who crossed on the Mayflower fled religious persecution, wishing instead to worship a personal God, not a state-run God(2). 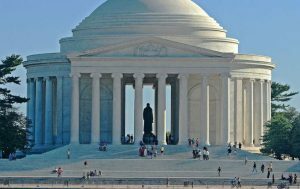 The founding fathers, and those who followed in our nation’s leadership for decades, were so engrossed in their Biblical beliefs that they left a trail of writings and monument inscriptions carved in stone. The stones cry out today against the lies being taught in our public schools and colleges. 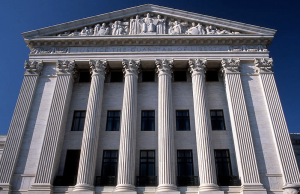 Even the doors of the Supreme Court have the two tablets with God’s law engraved on them. Inside the Lincoln Memorial are numerous phrases that acknowledge God and citations of Bible verses. One quote states, “That this nation, under God, shall have a new birth of freedom—that government of the people, by the people, and for the people shall not perish from the earth.” Other quotes include Matthew 18:7, Psalms 19:9 and Isaiah 40:4-5. Religious artwork is found all around Washington DC, including in the Capitol Rotunda. There the prayer service of Christopher Columbus is prominently displayed, along with the Baptism of Pocahontas and the Pilgrims having a Bible study. In the Cox Corridor of the Capitol the words “America! God shed His grace on thee” are inscribed. And at the east Senate Entrance the words “Annuit Coeptis” — Latin for “God has favored our undertakings” — is there for all to see. 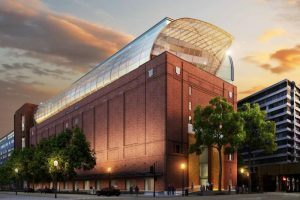 Recently, Hobby Lobby’s owner Steve Green put up hundreds of millions of dollars to finance the Museum of the Bible in Washington DC (pictured below). It’s located near the National Mall, only three blocks from the Capitol. The museum has hundreds of ancient Biblical artifacts and history exhibits. With all this info for Christians to see in our nation’s capital, we’ve planned a great weekend trip in early June 2019 to see for ourselves our nation’s spiritual roots. The visit will also include the Museum of the Bible and other notable Washington landmarks. Should be fun! This Thursday-to-Sunday weekend will be hosted by Andy Woods,President of Chafer Seminary. Andy will do several Bible studies throughout the weekend on the history and purpose of our Constitution as it pertains to Christianity. 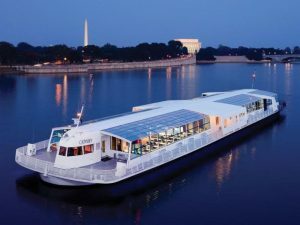 We’ve also included in our itinerary a Dinner Cruise on the Potomac! (See pic below) And even though it’s a long shot, we’ve also requested a private meeting with President Trump. 🙂 Probably won’t happen, but we’re asking! You can even come in a day or two early or stay later and see even more, it’s going to be an outstanding weekend! There’s never been a better time to spend a weekend in our nation’s capital learning about our Christian roots. So join us in Washington DC, June 6-9, 2019 for Compass’ Christian Heritage Weekend!